Ali was shaped by his times. But his death should remind us that he also shaped them. The reverberations. Not the rumbles, the reverberations. The death of Muhammad Ali will undoubtedly move people’s minds to his epic boxing matches against Joe Frazier and George Foreman, or there will be retrospectives about his epic “rumbles” against racism and war. But it’s the reverberations that we have to understand in order to see Muhammad Ali as what he remains: the most important athlete to ever live. It’s the reverberations that are our best defense against real-time efforts to pull out his political teeth and turn him into a harmless icon suitable for mass consumption. The question is why? Why was he able to create this kind of radical ripple? The short answer is that he stood up to the United States government… and emerged victorious. But it’s also more complicated that that. Damn. This is not only an assertion of black power, but a statement of international solidarity: of oppressed people coming together in an act of global resistance. 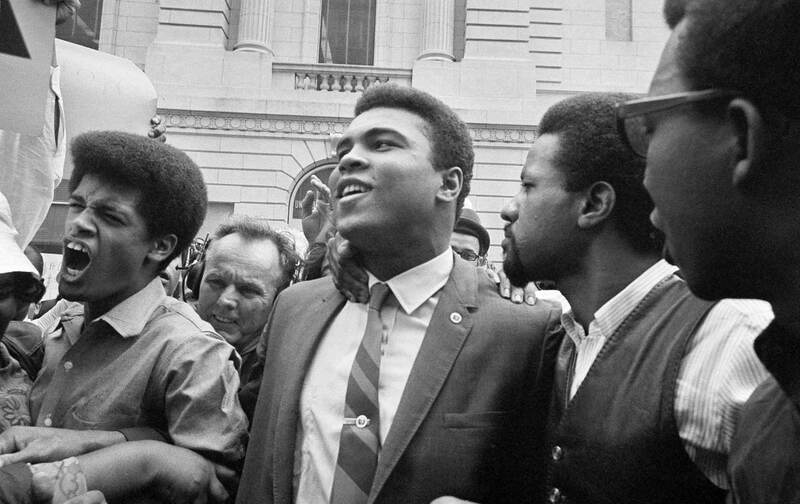 It was a statement that connected wars abroad with attacks on the black, brown and poor at home, and it was said from the most hyper exalted platform our society offered at the time: the platform of being the Champ. These views did not only earn him the hatred of the mainstream press and the right wing of this country. It also made him a target of liberals in the media as well as the mainstream civil rights movement, who did not like Ali for his membership in the Nation of Islam and opposition to what was President Lyndon Johnson’s war. But for an emerging movement that was demanding an end to racism by any means necessary and a very young, emerging anti-war struggle, he was a transformative figure. In the mid-1960s, the anti-war and anti-racist movements were on parallel tracks. Then you had the heavyweight champ with one foot in each. Or as poet Sonia Sanchez put it with aching beauty, “It’s hard now to relay the emotion of that time. This was still a time when hardly any well-known people were resisting the draft. It was a war that was disproportionately killing young Black brothers and here was this beautiful, funny poetical young man standing up and saying no! Imagine it for a moment! The heavyweight champion, a magical man, taking his fight out of the ring and into the arena of politics and standing firm. The message was sent.” We are still attempting to hear the full message that Muhammad Ali was attempting to relay: a message about the need to fight for peace. Full articles can and should be written about his complexities: his fallout with Malcolm X, his depoliticization in the 1970s, the ways that warmongers attempted to use him like a prop as he suffered in failing health. But the most important part of his legacy is that time in the 1960s when he refused to be afraid. As he said years later, “Some people thought I was a hero. Some people said that what I did was wrong. But everything I did was according to my conscience. I wasn’t trying to be a leader. I just wanted to be free.” Not the fight, the reverberations. They are still being felt by a new generation of people. They ensure that the Champ’s name will outlive us all.